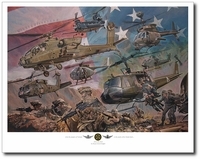 To this day the distant thump of a Huey's rotor blades stirs deep emotions in all those she carried during the Vietnam War. In this release, Joe has captured this icon of the War in one of it's most fulfilling roles, bringing a load of grunts back from the bush. This is a combat workhorse with muddy skids, stowed seats, chipped paint, patched bullet holes and a precious cargo of tired, tattered, dirty, but happy infantrymen. 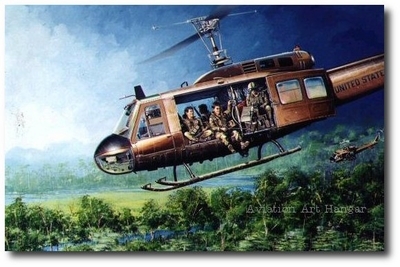 The crew chief and gunner keep a watchful eye out for any who would stand between these men and home, as does a Huey gunship that flies shotgun in the background.